The oldest of the Fortune Lounge Group of online casinos, 7Sultans is one of the most reputable and popular sites to enjoy real money pokies, huge jackpot progressives and plenty of other table and niche games – with the site consistently expanding and evolving to meet the ever-changing casino market. With a huge catalogue of casino games, a dedicated mobile and tablet casino in addition to its standard downloadable client and Instant Play modes on computer, high-quality customer support and top-notch banking security for funding our accounts, 7Sultans is one of our top picks for international slot machine lovers. Games: Over 400 real money online titles, including pokies, progressive jackpots, baccarat, bingo, blackjack, craps, keno, roulette, video poker and more. 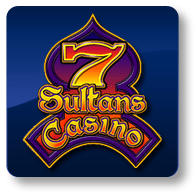 7Sultans offers online players huge deposit advantages to get the most out of your cash. To redeem the offer, create a free account by clicking on any of our 7Sultans links on your computer or mobile devices and follow the sign-up prompts. Once set up, head over to the banking section to choose your method of depositing funds. Catering to multiple currencies, 7Sultans lets us claim up to $/£500 in free cash credits upon registration, distributed over a maximum of your five first deposits. You can choose to claim the entire $/£500 bonus in one hit or spread it out over multiple deposits. For full terms and conditions, head to 7SultansCasino.com. The welcome package is a generous bonus to take advantage of should you want to make your playing money last longer for better chances of winning big. As expected, welcome packages are subject to wagering requirements – i.e. you must bet a certain amount of the free cash before being able to withdraw. 7Sultans employs a refined, simple casino interface that is easy to navigate and pleasing to the eye. Straight from the home-page as a guest or upon logging in, all games are neatly categorised to easily find what you are looking for, with a search bar usable for specific games. Every game on 7Sultans is playable via your Web browser in a no-download format, often referred to as “instant play“. So long as your preferred browser has the appropriate updates in HTML5 and Flash technology (often automatically installed on newer computers and laptops), most players can access and play every game they want within moments. However, should you desire, the site offers a dedicated downloadable software client which acts as the official computer program to access their casino offerings. Other than a few design changes and slightly faster loading (due to needing to download game software directly to your computer), this is a good option for players who don’t share computers and want a specific program to access games from 7Sultans. Check out 7Sultans Casino’s best pokies games software for more information on their current games catalogue. 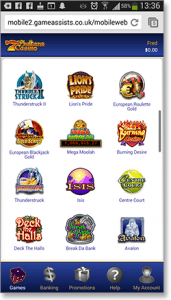 The mobile casino interface is modified to fit the smaller touch-based screens of smartphones and tablets, and some pokies games also make use of touch controls, though the core gameplay remains the same. Everything is playable via no-download ‘Instant Play’ mode using the same login details as on our home computers. In addition to the generous matched welcome bonuses, 7Sultans hosts weekly game tournaments, monthly promos and live leaderboards to encourage social play. They also host comps with healthy prize pools and grant loyalty points to members, encouraging long-term play for additional rewards. Unique to 7Sultans is a referral program which rewards you 50 free casino credits for every friend you get to join and play at the site – just invite your mates through the contacts section in your 7Sultans profile and enjoy the bonus. The referral bonus increases with each friend you invite to sign up, and your friends get a bonus, too. In conjunction with the International Slots League and also available at other Fortune Lounge group casinos (Royal Vegas and Platinum Play), players are 7Sultans can win up to $40,000 in cash and prizes weekly by playing head-to-head against other real players over the Web. With a dedicated live leaderboard system which tracks your wins accurately and encourages some healthy social competition, this multiplayer aspect of the site is a big draw and certainly worth considering when deciding on whether 7Sultans is the right casino venue for you. All new registrations and existing members with accounts on 7Sultans can visit the site’s customer support centre page, which lists all the ways users can contact the operator with their problems and queries 24 hours a day, 7 days a week, every day of the year. This includes conventional methods like the dedicated toll-free hotline (1-800-658-460), email or Live Chat, and a ton of other handy services like Skype, iMessage ([email protected]), WhatsApp (+27 76 073 9635) or BBM. Ready to play high-stakes, premium real money online pokies? Register for free at 7Sultans Casino now and receive up to $/£500 in tailor made 100% matched deposit bonuses.